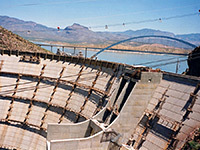 Theodore Roosevelt Lake was formed by the construction of a masonry dam on the Salt River in 1911, making it the oldest artificial reservoir in Arizona. About ten miles of the original river are now beneath the waters, and in the other direction one of its major tributaries, Tonto Creek, is flooded for about 8 miles although the lake level and hence the overall length is quite variable. 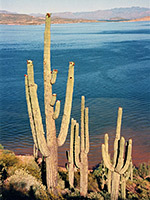 The reservoir is a major center for fishing, boating, camping and general vacationing, and despite being quite close to Phoenix, the shortest route is via the partly unpaved Apache Trail, so the number of visitors is rather less than for some other water-based recreational sites in the Tonto National Forest with easier access such as Lake Pleasant and Saguaro Lake. 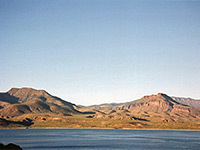 The lake is the largest in the state except for those on the Colorado River, and the southwest shoreline is easily reached from AZ 188, which runs close to the lake for most of its 18 mile length, passing various marinas and campsites. Some of the shoreline access points used to be free, but fees are now charged. In contrast, the opposite (northeast) side of the lake is much harder to reach overland as the terrain is more mountainous. One unpaved route (FR 60, or A-Cross Road) winds through the hills, from Hwy 288 in the east to Hwy 188 north of the lake but this runs several miles from the shore and only a few long and bumpy 4WD trails lead towards the water. One point of interest along the track is Salome Creek, best approached from the north end - this is famous because of a short section of granite narrows ('The Jug') with smooth, sheer, pinkish-white walls, deep pools and waterfalls. In common with other reservoirs in the Phoenix area, summer water temperatures of Theodore Roosevelt Lake can exceed 90 °F, but cooling afternoon thunderstorms are common. In recent years the water level has been low, in part due to the need to maintain supply to the other lakes on the Salt River downstream - in some places the shoreline may be half a mile distant from the high water mark, at 2,120 feet elevation. Still, in such conditions many good beaches are exposed which provide excellent camping opportunities, close to the water, although in some places soft mud makes vehicular travel difficult. Two good, secluded locations are Cholla Bay and Bachelor Cove, both along Hwy 188 a little way north of Theodore Roosevelt Dam. Other points of interest reached from Hwy 188 are the following, from north to south. Horse Pasture Recreation Area contains 1.5 miles of sandy shoreline accessible to most vehicles including RVs, and is one of the main locations for primitive camping. The place is often rather crowded, however. Cholla Campground is the largest official site, with paved roads and full hookups, and it benefits from a scenic setting on a low mesa, projecting out into the lake. Vineyard Canyon, a day use area, has picnic facilities and short trails to the lakeshore, here lined by stony slopes rather than sandy beaches. A pull-out just west of Theodore Roosevelt Dam is the start point for the Vineyard Trail, the only maintained hiking path along the lake, climbing the cactus-covered hills for fine views over the Salt River Valley and the Apache Trail. East of the dam are various facilities including a ranger station, day use areas and Roosevelt Lake Marina. Further southeast, the highway moves away from the shoreline though side roads lead to four more lakeside recreation areas: Porter Spring, Windy Hill, Grapevine Point and Schoolhouse Point, all of which also allow camping, for a fee. For free camping, the best locations are along several unpaved tracks on the south side of the highway, east of the turn-off to the cliff dwellings of Tonto National Monument.